A photographer known for his gorgeous and haunting pictures of New York City tragically died on Wednesday morning after attempting to ride on top of a Coney Island-bound F train. According to the New York Post, Christopher Serrano, 25, had ventured between two of the train’s cars before attempting to climb on top of one, where he was believed to have been "clipped" by something while the train was approaching the Fourth Avenue/9th Street station. He was discovered dead on the roadbed by police soon after. The Gothamist reports that Serrano was a Brooklyn native who often posted photos on Instagram under the alias HeavyMinds, where he gained over 119,000 followers. Fans of Serrano have since flooded the account with comments expressing their love for his work and how heartbroken they are to have heard of his death. 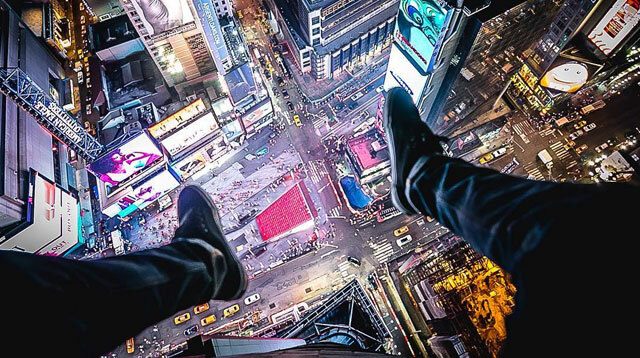 His last photo—which has received 10.9k likes so far—was a shot from the top of a skyscraper in the middle of Times Square, with Serrano’s legs hanging over the edge. He captioned the photo, "It’s lonely up here."